WoW is five years old this week - remember life before the guild? But how can you kill that which has no life? 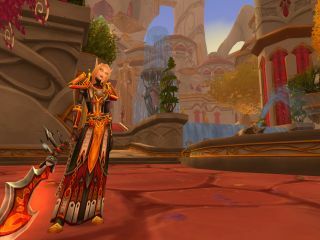 World of Warcraft is a mere slip of an MMO, reaching the age of five years old this week, with over 11.5 million players worldwide now hanging out in the virtual fantasyland that is Azeroth. For many of those millions of eager gamers, it is quite possibly hard to remember how we ever lived without World of Warcraft! Released November 23, 2004, the game has set the benchmark for the still relatively new genre of MMORPGs (massively multiplayer online role-playing games, as if you didn't know already). On average each of those 11.5 million (plus) gamers shells out around $15/£10 a month to WoW's publisher and developer Blizzard Entertainment – which is their entry-fee to a fantasyland that many use (and some abuse) as a calming, controlled and at-times necessary escape from the venality and tedium of real-life. And, of course, some of them just like to murder innocent elves and chat-up imaginary dwarves. Hey, whatever floats your boat… TechRadar has never been one to judge how you spent your leisure time on the internet! Wired notes how other game designers love to play WoW including Tetris creator Alexey Pajitnov and BioShock creative director Ken Levine. "It's the game I've played more than any other," said Levine "It's an aesthetic masterpiece…. So much of the world tells a story when you look at it." Levine still devotes a good few hours to WoW every week. "I just love being in that world… When you go into [the city] Stormwind, you go across the bridge and see all those giant statues of the heroes, that sells the space. It's over the top, it's huge and you know what you're getting into. "Any project where you need to sell people on a space in a videogame, you can learn something from World of Warcraft."